It’s been a quieter review week, but there’s still plenty pouring in. Deanna talked about her favourite fantasy podcast and Susy returned to being a Series Maniac! Runalong had high praise for Jen Williams’ The Bitter Twins (warning: contains spoilers for The Ninth Rain), and a measured view on Leo Carew’s debut The Wolf. C at The Middle Shelf and I don’t always share tastes, but we’ve had a couple of weeks of agreeing fiercely about just how good some of our recent reading has been. C was deeply impressed by Hari Kunzru’s White Tears (as was I – what a book); and I was won over by Silvia Moreno-Garcia’s The Beautiful Ones (as C was last week). However, upcoming YA tentpole Furyborn is beginning to split opinion – not a bad review in sight, but Deanna had some reservations about it, while Annemieke was warmer in her praise. Meanwhile, Lisa was bowled over by Kat Howard’s An Unkindness of Magicians, and both Lisa and I continued our love-in with Serial Box’s swashbuckling political drama Born to the Blade. Last but not least, Jenna explored the delights of a reread by revisiting Naomi Novik’s Uprooted while Annemieke was won over by new urban fantasy Bones and Bourbon. The Daggerspell read-along is in full swing! This is an informal ‘read on your own time, then come chat on Twitter‘ sort of event, so if you fancy joining us just grab the book and pile into the weekly chat threads! If you’ve read the books before, please avoid spoilers – we have some first-time readers! Having finished The Farthest Shore, the #Muskedragons #Earthsea tweet-along will pause to catch our collective breath from the FEELINGS. Watch out for reviews coming later this month. The #wyrdandwonder photo challenge may be – gasp – my favourite thing: a daily dose of book love that streams in across each day! Feel free to pitch in at any time – just pop the prompt and a photo on your social network of choice and tag us in. Did I miss something you posted? Drop me a note in the comments! 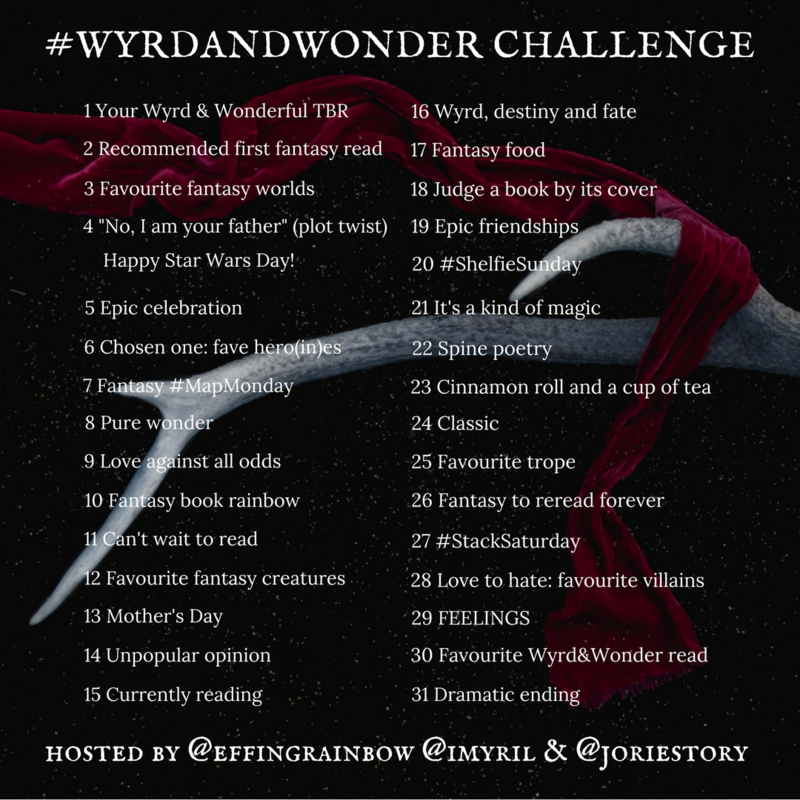 Remember, tag @wyrdandwonder if you’re on Twitter or add an entry in the schedule if you’re not to make sure that we don’t miss any of the fun. Posted in Wyrd and Wonder, Wyrd and Wonder 2018 and tagged epic fantasy, fantasy, grimdark, sff, urban fantasy, Wyrd and Wonder, young adult. Bookmark the permalink. Thanks for the shout out again! Argh I knew something had got away from me! Sorry about that. I feel bad that my reading schedule didn’t include any fantasy this month😐 but hopefully you’ll host this again next year and I can join in. But I’m having fun stalking all the participants’ blogs! I love all the cool stuff coming out for this event- you guys are doing awesome. I’m going to check out a bunch of these links!